I’s the time of the year to keep the kids entertained and that means animated movies. This time around, we have sequels to a couple of popular movies, Monsters Inc. and Despicable Me. 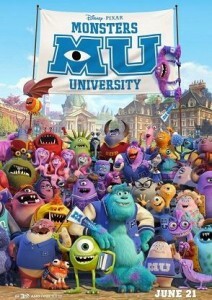 Monsters University is actually a prequel to the first movie. We pick up with Mike Wazowski in high school on a field trip to Monsters Inc. He is the little nerd that no one really likes and becomes enamored with Monsters Inc., wanting to be a famous scarer. Years later, he starts at Monsters U, braces and all. He hits the books, assured that tests grades will make him a great scarer. Also enrolling with him is James P. Sullivan, part of the great Sullivan line. While good with his roars and basic scares, he is far from versatile in his scariing which means he’s only good in a few situations. The two monsters start an early rivalry when Sully becomes popular just on his demeanor and heritage while everyone still doubts Mike. When their rivalry flares during their final exam, both get kicked out of the scarer program. In an effort to get back into the program, Mike makes a bet with Dean Hardscarabble that could get him totally expelled. He recruits the loser fraternity to take part in a competition but they are short a person so Sully joins in for a chance to get back into the program too. I think everyone could guess that the contest comes down to Mike, Sully, and crew and their rivals in the movie with the team eventually winning. The fact that Sully cheated to give Mike a boost leads Mike to try to prove himself. Sully ends up going to help and the two of them end up breaking scaring records but still get themselves expelled. So, instead of getting themselves into Monsters Inc. based on a degree, they work their way up through the ranks to the point we see them in the first movie. While there is some predictable parts, the movie is still fun with a couple surprises along the way. The characters are interesting and it’s good to see them grow to where they are in the first movie. Trying to jump back prior to a first movie doesn’t always work, but I think it does in this movie. We start off with a birthday party for Agnes (the youngest daughter) and Gru fitting in with all the neighbors. There’s even one neighbor trying to fix him up with everyone she can think of. Next we get Lucy kidnapping Gru and a couple minions and taking him to the base for the Anti-Villain League where they try to convince him to help them find a villain who stole a serum that transforms creatures into big, insane, purple versions of themselves. Also, the villain is working at the mall of all places. There’s all sorts of tension between Gru and Lucy as they work together in a very obvious “they are going to fall in love” manner. Then we introduce some characters in the mall that are under suspicion. Gru meets one named Eduardo whom he swears is a presumed dead villain called “El Macho” but no one believes him. (This obviously means that he is the bad guy.) Just to make things worse, Eduardo’s son falls in love with Margo, the oldest daughter. Eventually, we find out for sure that Eduardo is the villain and he has been capturing the minions to use the purple serum on them. 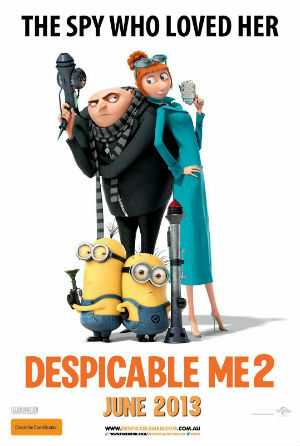 Gru fights his way through, saves the minions and Lucy and stops the bad guy. Then Gru and Lucy get married and live happily ever after. Honestly, the movie couldn’t have been much more predictable. The only real humor involved the minions. Agnes having trouble with a Mother’s Day play and being able to say her lines and then being able to do so perfectly at the wedding was just beyond tacky and expected. While it was a cute movie, it didn’t come close to comparing to the first movie. The main characters were boring and all together predictable. Without the minions in the background, the movie wouldn’t have been worth seeing. If you can only see one movie, I would definitely go see Monsters University. If you can go see a second movie… find something else you want to see or save the money for something else coming up. (I’m waiting for RIPD to come out.) I really liked MU but I probably would have passed on DM2 if I had known what it was going to be like.